Each Tibbit device has a label which states this Tibbit's number and function. 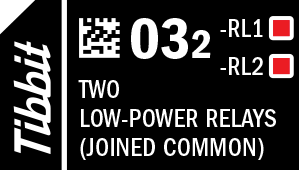 A small 2D barcode (micro QR type) encodes the Tibbit number as well. This number is a 4-digit code. First three digits in the code represent Tibbit number, and the fourth digit indicates the device version (some Tibbits have more than one version available).